Statehood Day gives you an opportunity to tell legislators why local history matters. Ohio history advocates will unite on Tuesday, March 1 to promote history and recognize the state’s birthday at the annual Statehood Day event at the Ohio Statehouse. The Ohio Local History Alliance is one of 13 statewide hosts for the annual gathering. 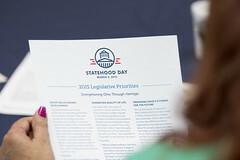 The Statehood Day event brings together Ohio’s history supporters and gives you the opportunity to meet with your state legislators and network with fellow history-related professionals and advocates. You can register for the event online at www.ohiohistory.org/statehoodday. 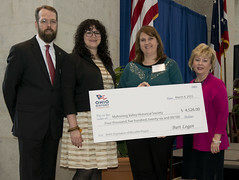 This year’s event will highlight several issues of importance to state and local history-related organizations and culminate in the awarding of more than a dozen Ohio History Fund grants for local history-related projects across the state. The Ohio Local History Award will also be given to State Rep. Kirk Schuring (R-Canton) for his championing of the successful Ohio historic preservation tax credit program. Marion Werkheiser, founding partner of Cultural Heritage Partners in Washington, D.C., will be the keynote speaker at lunchtime. Attendees are encouraged to schedule a meeting that morning with their state representative and/or state senator. Registration for the event is $30, which includes lunch. To register and for more information, visit www.ohiohistory.org/statehoodday. Statehood Day is co-sponsored by the Ohio Local History Alliance, the Ohio History Connection, Heritage Ohio, the Ohio Archaeological Council, Ohio Humanities, the Ohio Genealogical Society, the Ohio Historical Records Advisory Board, Preservation Ohio, the Ohio Travel Association, the Ohio Academy of History, the Ohio Council for Social Studies, the Society of Ohio Archivists and the Capitol Square Review and Advisory Board.